Storm water runoff from recent rain has severely damaged the Island’s roads and drainage infrastructure, making some areas dangerous for the Community Vehicle to use safely. Roads with severe gradients such as Hilda Avenue, Cecil Street and the “hair-pin” bend leading to the top of the Island, now have deep ruts and pot holes make driving dangerous for both drivers and passengers, as well as the vehicle. These roads are now considered off-limits to the Community Vehicle until further notice. We apologise to all of our customers for this inconvenience, but driver and passenger safety comes first. SIRA has requested Council to urgently attend to emergency maintenance in these particular locations as well as other areas requiring attention as a result of the storm. Church Point, Bayview, Scotland Island, Offshore community and local residents are welcome to come along to our Coffee Catch-Up morning this Friday 22 May, with Pittwater Mayor Jacqueline Townsend and Council’s General Manager Mark Ferguson at The Waterfront Store and Café, Church Point from 8.00 - 10.00am. Enjoy delicious coffee and freshly baked goodies, and come along and have your say about local government reform and any other issues. Ask your questions and find out how we are tracking with the ‘Fit for the Future’ process. Find out about Pittwater’s options, and please fill in the survey either on paper on online by June 5. The views of the Community are critical to determining what’s best for Pittwater, and our Mayor and General Manager will be on hand to hear your views on the three options. See you at The Waterfront Store and Cafe this Friday morning – coffee in hand! Please pass this invitation on to your networks. Residents unable to attend the meeting are encouraged to go online have your say via the online survey on our website, www.pittwater.nsw.gov.au/reformwww.pittwater.nsw.gov.au/reform . the place up for the occasion so members of the Community Fire Unit, SIRFS members and other volunteers have recently taken on the task. Our first big ‘thank you’ is to Scotty for his amazing help disposing of masses of resultant ‘green waste’. The ANDREW THOMPSON MEMORIAL has been upgraded. 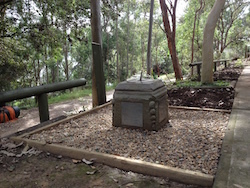 Originally located in the park this memorial was moved to the fire station to protect it from being vandalised. 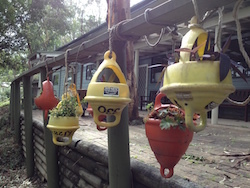 Donated by the Warringah Historical Society it’s something of historical value to the island and worth maintaining. Recently installed at the station is the artwork BUOYS WILL BE BUOYS which was generously created for the CFU by one of Scotland Island’s best known and best loved artisans. A huge thank you to Eamon Hamilton for his talent and his generosity. Finally a thank you to those few people who did install house numbers outside their properties. It’s really important that emergency services are able to quickly identify properties and having a visible house number is the best way. So please give it some thought . None of us know when it may be our turn to need emergency assistance. 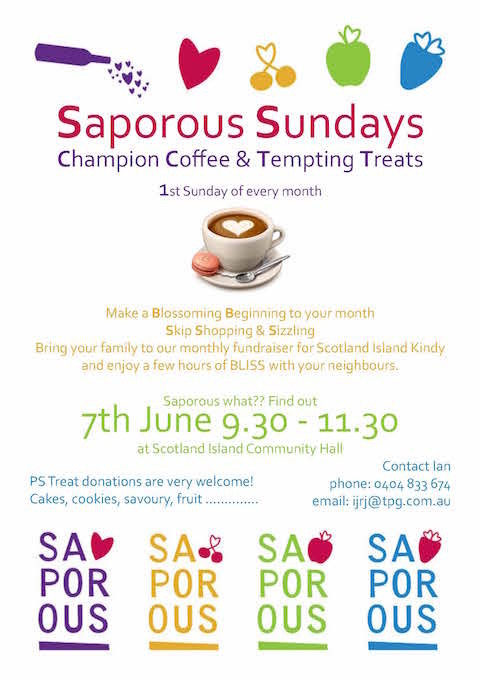 Champion Coffee & Tempting Treats are on offer on the first Sunday of every month at Scotland Island Community Hall. Bring your family to our monthly fundraiser for Scotland Island Kindy and enjoy a few hours of BLISS with your neighbours. PS Treat donations are very welcome! We have a second hand, queen-size Futon mattress that we no longer need (mattress only). If you would like it, please call Leanne on 0410 680 825.